Protected bike lanes are the biggest new thing in years for helping more Americans enjoy time on two wheels. When U.S. cities started building them in significant numbers five years ago, they discovered that this little change — putting curbs, posts, planters or parking spaces between bike and auto traffic — makes a huge difference to a street. Since then, the country has collectively rewritten the book on designing for bikes. Protected bike lanes are now the gold standard for comfortable riding on busy streets. The next challenge is to get more built in more places more quickly. That’s why, starting today, cities around the United States are celebrating National Protected Bike Lane Week. And it’s why we created this infographic summarizing all the great things protected bike lanes can do — not just for people who bike, but for everyone. The celebrations planned around the country for this week and next show the variety of cities in which protected bike lanes are now hitting the ground: Iowa City, Chattanooga, New Orleans, Tallahassee, Indianapolis. Want to celebrate protected bike lane week yourself? An event could be as small as a ride with your best friend or as big as the biggest crowd of bikes your newest lane has ever seen. On Wednesday in Denver, Councilman Albus Brooks will join downtown riders for a three-stop progressive breakfast along Arapahoe Street, which got a protected bike lane last fall. “We have plenty of food and it’ll be a party,” said organizer Alexis Nichols. 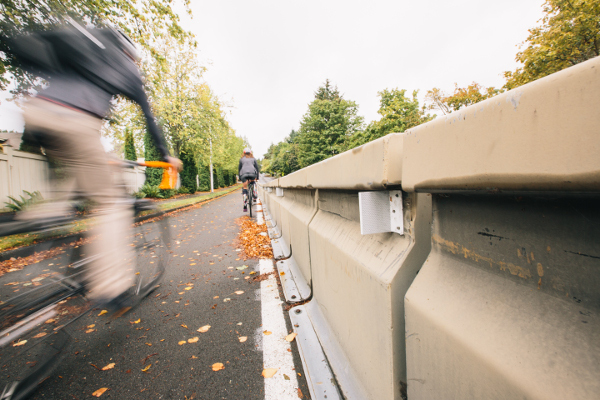 On Friday in Aurora, Illinois, Mayor Tom Weisner will join an estimated 100 people for a ribbon-cutting, ride and raffle on River Street, where the city just closed a crucial gap in the 43-mile Fox River Trail by running a protected bike lane through downtown. Organizer Gina Moga said they’ll be raffling off two bikes donated by the local shop All Spoked Up. All this week in Portland, Oregon, the city will celebrate the week with an on-street test of a protected bike lane on Northeast Broadway, sponsored by local businesses. Exactly. 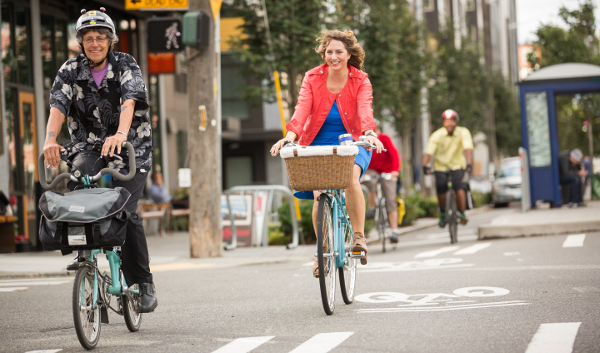 As we like to say, the best thing about a bike-friendly city isn’t the bikes — it’s the city. Protected bike lanes are here to stay, and they’ll be making American cities of every size and shape better in the years to come.